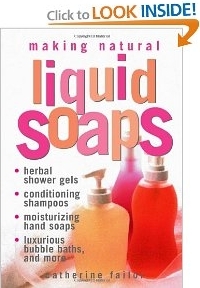 Finally, a book on making liquid soaps at home! Let expert soapmaker Catherine Failor introduce you to the luxurious world of all-natural liquid soaps - the easy way. Using a simple double-boiler technique, you can create inexpensive moisturizing hand soaps, revitalizing shampoos, invigorating shower gels, soothing bubble baths, and much more. And all tailored to your skin type, to your hair's needs, or even to your mood! Discover how easy it is to master this special hot-process soapmaking technique and explore the art of this rewarding craft. Using simple, pure ingredients, such as cocoa butter, lanolin, and jojoba, you can create liquid soaps that are better for your skin, better for the environment, and just plain better than any you'll find in a store. Learn to blend oils and additives, add color and scent to your creations, and develop one-of-a-kind personal soaps - all in your own kitchen! Let the soap and your creativity flow! Before World War I, all liguid soaps were based on potassium hydroxide. But the shortage of fats and oils in wartime forced commercial soapmakers to consider other alternatives. Synthetic detergent soaps quickly became th norm and have remained so ever since. Many people today, though, are seeking alternatives to detergent soap, and potassium soap is ideal. It's formulated with pure, natural ingredients; can be tailored to fit different skin types; and is easy and inexpensive to make. Potassium soaps are also very versatile - one "base" formulation can be modified with one or two ingredients to form a haand soap, a shampoo, or a bubble bath. Webmaster message: Because of skin problems, many people are seeking more natural products. I was thinking of this as a great product for a home business. Lisa Kempinski of Peoria, Arizona says, "I had never tried making soap before, but became interested after learning about all the awful chemicals in commercial products so thought I would give it a try. This book has been a wonderful resource. My first attempt came out perfect, clear and lathered great! I love this book, and would recommend it to anyone who is wanting to learn how to make liquid soaps. The author explains exactly what to do in very easy to follow step-by-step instructions. And after you get the process down you can customize your soaps to your own needs. The bath gels are awesome. One reviewer says not to fragrance until ready to use, but the fragrance really comes out after you have let it squester for 14 days. Mine smell wonderful and the amount of essential oils used is not much at all. The secret to making the soaps thicker is to dilute as little as possible, but this will depend on the type of oil you are using, which the author does a very good job of explaining, what type of oils produce what type of product and the additives you can choose to use. I perfer not to use the alcohol or borax and my soaps still turn out fine. If you want a really nice bath gel use a higher precentage of soft oils as explained in the book. You will have to read the book more than once as there is too much information to absorb at one time.